TECHNOLOGYis the application of science to make human lives better. HISTORY is the study of past events; sometimes this is determined through a written record, sometimes through archeology. HISTORY of TECHNOLOGY is the study of how science was applied, in the past, to advance civilization and make human lives progressively better. One of the earliest technological inventions: The Wheel. in present-day Iraq or Iran around 3500 BC. Since this class is taught in Canada, which is in North America, it would be respectful of us, when noting primitive technology, to mention the contribution of the North American native peoples.eg. Maple syrup ! canoes ! Nativetech is a massive site, you are not expected to view all the links, just look at a few to get an understanding of some of the technologies applied by Native peoples in North America. Long distance navigation of North American waterways by birchbark canoe had the consequence of allowing vast areas of the continent to be explored and mapped. Try searching Yahoo.com or other sites with words like "primitive technology" and you will be frustrated by a lot of false leads to personal web pages put up by survivalists trying to learn neolithic skills cause they fear the coming Y2K deadline. A party of French troops found a black basalt slab, near to the town of Rashid in 1799, inscribed in three languages. The slab was a tribute to the Egyptian King Ptolemy V, with the original heiroglyph, a more modern demotic script, and, the key to our knowledge of Ancient Egypt today, a Greek translation alongside carved in 196 BCE. The French returned control of Egypt to the English, and the Rosetta Stone, as it had become known, was taken to London, where it can still be seen as a prize exhibit in the British Museum, in Bloomsbury. - includes cross sectional diagrams, eg. The Last "Wonder of the World"
Thirty times larger than the Empire State Building, the Pyramid's features are so large they can be seen from the Moon. Its base covers 13.6 acres (equal to seven midtown Manhatten city blocks), each side being greater than five acres in area. Volume: A highway lane eight feet wide and four inches thick could be built from San Francisco to New York and put inside the Great Pyramid. The oldest large structure in existence, having been started 4,617 years ago, it is the sole remnant of the Seven Wonders of the World. Some people have very extreme and unusual theories of the Pyramids. This shaft was unveiled to the world on the FOX TV special. It opens in the causeway linking the Sphinx to the second pyramid. and built by normal people. For class today you are going to be a survivor from another time period who is cast away into a previous period in history. A simple summary of the main facts of the pyramids at Giza. The writer paints a "generous" portrait" of how the country felt about these projects. these structures" The reason why we do not all agree on how the pyramids were built is because there are too many inconsistencies in the theories of who the workers were, the dates involved, the technology used, the mathematics involved, etc. Although we may not be able to - even in "modern" times to know how they built the pyramids, it is possible to develop an interesting list of things they would have had to deal with. In class today we also took time in groups to make a list of problems and challenges that the Egyptians would have to overcome in constructing large stone projects like the Sphinx and Great Pyramid. eg. moving the stones !! "Ghana was the earliest of the great empires. In the markets of its capital in the southeastern corner of what is now Mauritania, not far from the Senegal River, local entrepreneurs bartered the gold, ivory, and slaves of black Africa for the salt of the Sahara and for the horses, cloth, swords, and books of North Africa and Europe. Salt was worth its weight in gold. The empire of Ghana then controlled the major sources of Africa's alluvial gold." The Iron Age south of the Sahara. Early sub-Saharan Africans developed metallurgy at a very early stage, possibly even before other peoples. Around 1400 BC, East Africans began producing steel in carbon furnaces. The Iron Age itself came very early to Africa, probably around the sixth century BC, in Ethiopia, the Great Lakes region, Tanzania, and Nigeria. Iron technology, however, only spread slowly across Africa; it wasn't until the first century AD that the smelting of iron began to rapidly diffuse throughout the continent. (steel was invented in the west in the 1700's). "The oral traditions of African kingdoms usually start with a male founder who persuaded or forced people to accept his rule. There are many such legends where the founder-king was a blacksmith signaling the importance of iron in African kingdom evolution"
Africa 300 B.C ~ 500 A.D. The Invention of Paper, 105 A.D.
One of the reasons people in China were able to share knowledge of science, technology and navigation in the early stages of the country's development was because they had a writing system which allowed information to be shared. Chinese developed the first compass, which allowed navigation over large bodies of water out of sight of land - which allowed Chinese people to travel to other island nations in Asia. 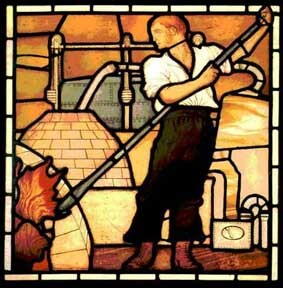 and later became a key export to Europe. Su-Sung and Chinese Water Clocks 1094 A.D. This video discusses bridge building as it was during the Song dynasty. This period was from 960 A.D. to 1279 A.D.
"The Song dynasty is notable for the development of cities not only for administrative purposes but also as centers of trade, industry, and maritime commerce. " - this raises the question of whether the Rainbow Bridge behaved with the properties of a "span", or an "arch"
In the video they research the properties of hemp rope versus bamboo rope and test bamboo rope for use in binding the members of the "Rainbow Bridge". As part of their research, they construct a small suspension bridge made of twisted bamboo rope. - but the high hump in the middle required a raised "approach"
From the first prehistoric dynasty 2600 B.C. to the Warring States Period ending in 221 B.C. China, as we recognize it today was unified for the first time in 221 B.C. 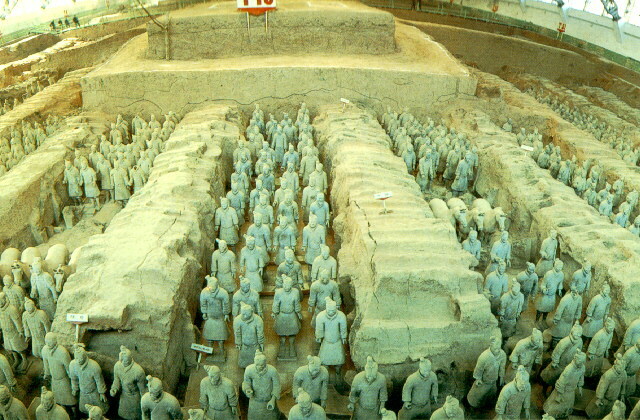 The western frontier state of Qin conquered its neighbours and the leader of Qin titled himself as the First Emperor. They built a series of four walls to keep out enemies and when the walls were linked, it became referred to as The Great Wall. One of the things limiting an understanding of ancient Japanese technology uses is the state of Japanese archeology. part of a speech by Dr. Jiro Harada from Eri Takase's extensive web site on Japanese culture. Elaborate works of stone with complex fortifications to defend against infantry. 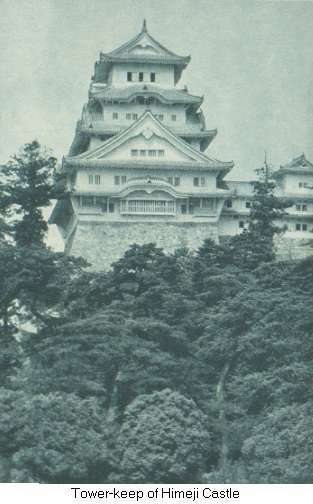 The design of Japanese castle was primarily based on defending against "ninja" and other attacks by stealth. Much of Japanese technology developed from military technology which had to do with feudal wars between the clans. He has an interesting perspective. The important thing to understand from reading this article is that the process of making Japanese swords was based on ritual - the Japanese did not have a solid scientific understanding of the principles they used and were only able to make copies of good swords each time by going through a long process of ceremony and ritual so that each weapon produced would be similar to the previous one. While everybody knows about the role that Japanese "ninja" play in the modern movies, it is very difficult to determine to what extent this group of people contributed to various weapons technology, and what part was myth. Some have suggested Ninja developed light gliders for travelling short distances, which, if true, would pre-date any "western" inventions of a similar sort. The problem with using the Ninja as an example of technology is that the culture was shrouded in secrecy and part of the "fear" they were able to project was based on hype that had no substance in reality. Although it may be difficult to substantiate the role of the Ninja in some questionable inventions, one thing that can be verified and subtantiated is that the Japanese were the first nation to develop high quality steel weapons that had the diificult combination of strength & flexibility, combined with a very sharp edge. Japanese sword making progressed to a point, through ritual and ceremony, were it became known worldwide. Essentially, Japanese sword makers took red hot iron, and through a long process of heating, and re-heating, they hammered the lump of iron into a long shape while repeatedly immersing the iron in a charcoal fire to re-heat it. By putting the iron in charcoal, during this process, they actually were pounding carbon into the iron and in fact "mechanically" making pure steel. Japanese metallurgy. There was little livestock on Japanese farms so they did not have many hides of animals from which to make strong lether. In order to heat the iron very very high temperatures, you need good bellows that can supply a constant supply of oxygen. The fact that Japanese artisans were able to make these better quality bellows, allowed the sword makers to work iron at higher temperatures and make better quality blades. Assignment You are required to show the professor the name of the person you have chosen for your biography, and identify what sources and resources (online and offline) you have accessed, in order to find the information and complete the assignment. Written and hosted by John Lienhard and KUHF-FM, Houston, Texas: The Engines of Our Ingenuity was a series of radio broadcasts which have now been turned into web pages. Quite a number of these pages contain topics which are discussed in our course outline for GNED 117. 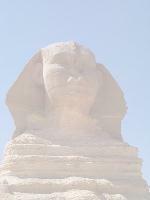 Dr. Silvestri has a massive web site that covers, chapter by chapter, Ancient World history. If you want to know about a particular period, here is a good place to look for simple facts in a good timeline order. With so many people worried about Y2K, there a number of sites on the WWW devoted to primitive technologies that people are interested in learning about - in case we get zapped back to the stone age and have to live without any modern technology. Anyway, this American site has interesting links to primitive technology web pages. This is listed here for your personal interest and is not part of the core outline of GNED 117. This is listed here for your personal interest and is not part of the core outline of GNED 117.